The Jungle Adventure Combo is a 5 in 1 combo that'll keep the kids busy for hours. 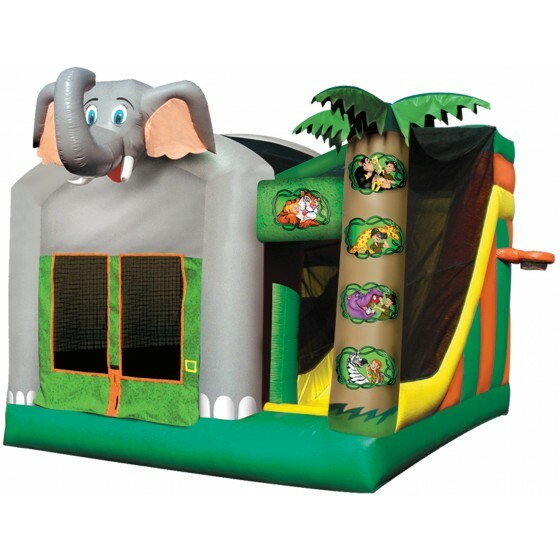 Outside there is a huge elephant welcoming you into the 170 square foot bouncing area. There's also a vibrant palm tree and jungle themed colors replicating the exact jungle paradise. Attached is also an outdoor basketball hoop to keep everyone active and engaged. Inside, there is one more basketball hoop, a safe climbing ladder, and a 13 foot, child friendly slide which empties out directly back into the bouncing area. This 5 in 1 Jungle Adventuire combo is perfect for your next birthday party, church event, or block party and promises to make memories that will last a lifetime.